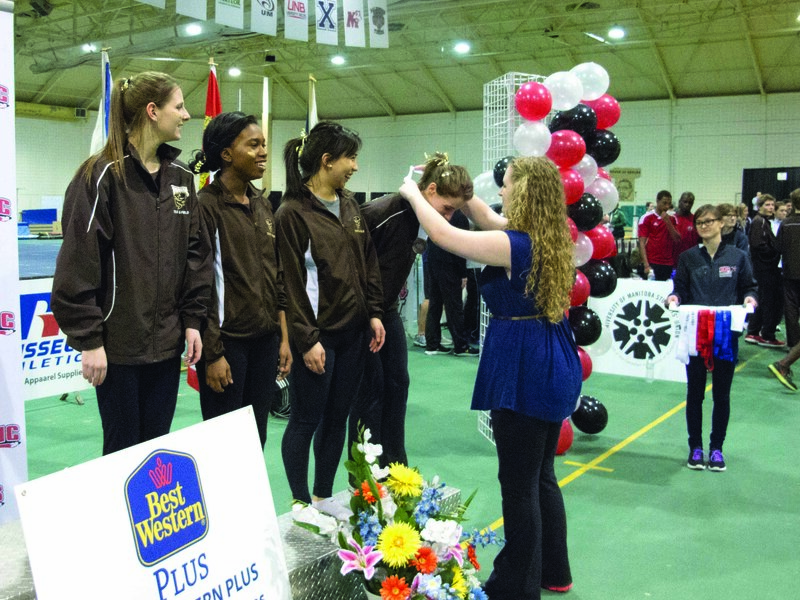 The Bison women’s 4×200 relay team grabbed a bronze medal for the University of Manitoba in the CIS Track and Field Championships with a final race time of 1:41.59 on March 10. Despite a rough handoff at the beginning of the race the team placed third, behind Calgary and Western, which moved them up six places from their ninth place-ranking coming into the competition. “We gave it all we had and [are] proud [of] our finish against strong competition,” said Harpelle, in statement to the media. The team originally finished fourth; Saskatchewan finished in first with their time of 1:39.16. Saskatchewan was disqualified, however, which meant Calgary was bumped into first with a time of 1:39.55. Winsdor, who finished second in the preliminaries with a time of 1:40.03, jumped into the lead at the start of the race, but finished last due to a commotion on the track where one of their relay members tripped and dropped the baton. Harpelle said she thought the final race was messier than her team’s preliminary heats, but didn’t think the commotion on the track threw them off and they still ran pretty smoothly. The Bison women’s 4×200 relay team had qualified for the final with a fifth-place finish in their preliminary race the day before, with a time of 1:40.56. The team’s coach, Claude Berube, said he was really pleased the team qualified for the finals and during their heat they improved their best season’s performance by three seconds. After the team qualified Lisa Wong, who ran second in the relay, said she felt “awesome” about the race and that the team was “pumped” to run in the finals. “Had we had perfect handoffs today I think we could have been top three going into [the finals]” Ogungbemi said after the preliminary race. The team proved themselves right in the finals on Saturday. Harpelle emphasized teamwork in the preparation for the finals saying that they will come together as a team, look like a team, warm up as a team and win as a team. The four women looked very much like a team after their races — in Bison uniforms with gold stripes on their cheeks and ribbons in their hair. Their teamwork paid off when they took home bronze for the Bisons. Kimberly-Ann Bordun, who ran fourth, said she has competed in past championships but this one was different because it was at home. “I’d say we’re more in our element and it’s really awesome to have our family and friends here supporting us,” Bordun said. Unfortunately the Bison men’s 4×200 relay team did not qualify for the finals as they finished ninth in the preliminaries with a time of 1:29.59. 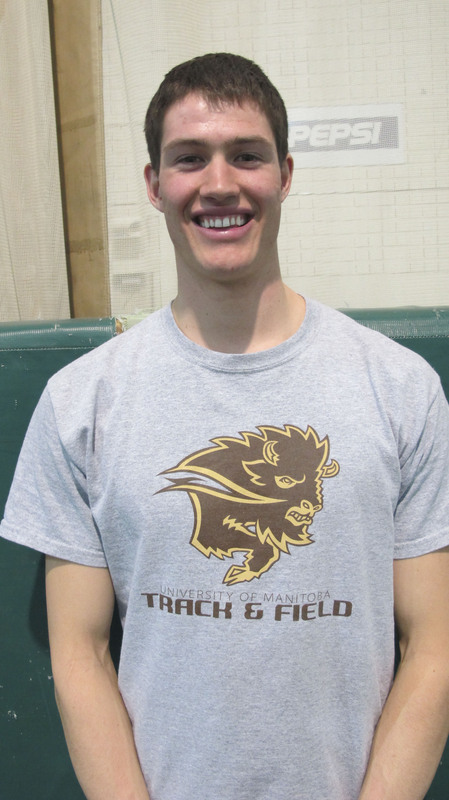 But the Bison men’s 4×400 relay team won the bronze medal in their final with a time of 3:16.57, coming behind Ottawa and Western. 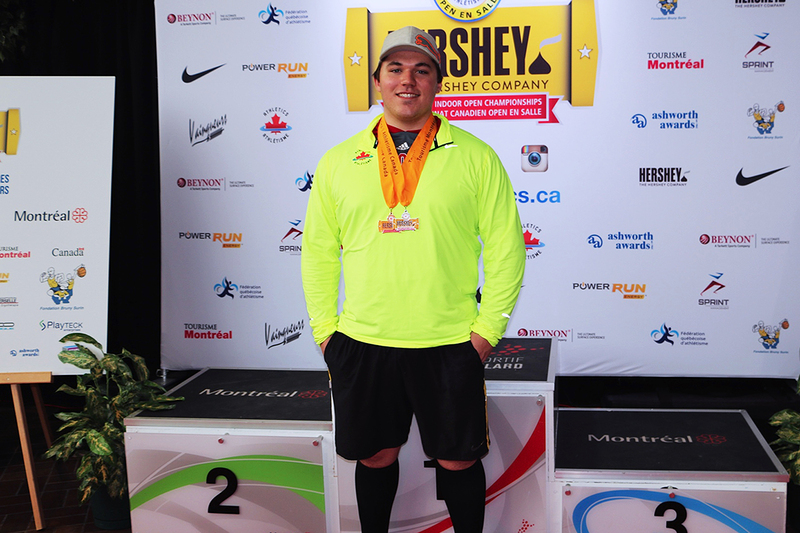 In a quote from the Bison Sports’ website, Berube said he was excited with the finish and gaining two medals.